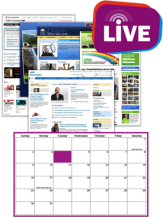 You are here: Home » News & Events » My Beautiful Intranet 2014 » Building our Community at Omicron! Building our Community at Omicron! As developers, designers and builders, Omicron Canada is in the business of creating sustainable, enduring communities. When we launched our new intranet in April 2013, we wanted to replicate this sense of community internally and connect people within our various lines of business and across multiple geographies. We are very proud of our intranet as it has become our online communication and collaboration portal where people can come together to connect, share, celebrate, discuss, learn and laugh. The social element of our intranet allows for real time sharing of information, comments and ideas from all areas of the organization which fosters a sense of belonging within the broader Omicron community. The intranet is built around four main hubs; PEOPLE, NEWS, TEAMS, and LIBRARY. In the past year, we have seen tremendous adoption of our new intranet community with 74% of people logging at least once per week and 94% logging in at least once per month. It is visually appealing and balances consistent content via our annual editorial calendar with the grass roots content, comments and input from all of our people. We are very proud of our community and appreciate the opportunity to invite you for a visit. Company or organization: Omicron Canada Inc.
Love some of the ideas in this. I know I would use it! News is great, simple navigation. Nice work.